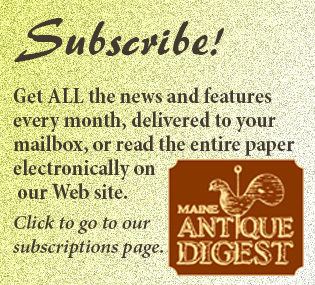 Marketplace for Collectors.com features images from advertisements appearing on the Maine Antique Digest Web site (www.maineantiquedigest.com). 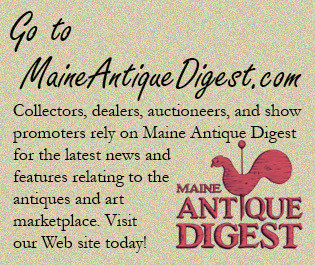 Maine Antique Digest, a monthly trade magazine, reports on the art and antiques market in America and abroad. Subscriptions are $43 annually. A subscription includes 12 issues as well as on-line access to the Auction Prices Database, the Cabinetmakers Database, the complete digital edition including back issues, and full access to the news archive. A digital-only subscription is available for $30 annually. If you’re interested in advertising on Marketplace for Collectors.com, e-mail <[email protected]> or call toll-free 1-877-237-6623, Monday-Friday, 8:30-4:30 Eastern Time.